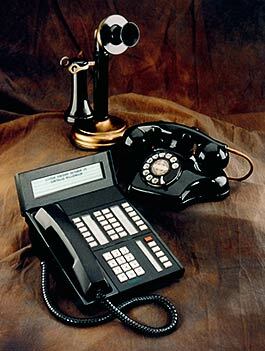 We feature the eOn Millennium and have dealt with eOn / Cortelco telecommunications systems and equipment since 1987. eOn’s roots stem from the original ITT Business Communications Corporation, privately purchased in 1990 under the Cortelco name, going public in 2000 under the eOn name. In 1897, when Milo Kellogg first opened the doors to the Kellogg Switchboard & Supply Company, he planted the seed that 90 years later would give birth to the company known today as Cortelco Kellogg, recognized as a pioneer in the mass production of telecommunications equipment, merged with ITT in 1952 to form ITT Kellogg. In 1957 the company converted an old theater in Corinth, Mississippi into a manufacturing facility. The division’s name was changed in 1965 to ITT Telecommunications, heralding an expanse that would continue through 1987 when the company merged with Compangnie General d’Eléctricité to form Alcatel, N.V., the world’s largest telecommunications equipment manufacturer. Shortly thereafter, ITT Business and Consumer Telecommunications Communications, formerly ITT Telecommunications, was renamed Corinth Telecommunications Corporation, giving rise to the name Cortelco®. Cortelco’s parent corporation, California-based International Telecommunications Corp (ITC), headed by Chairman David S. Lee, purchased the company in 1990. Now headquartered in Memphis, Tennessee, Cortelco has capitalized on 100 years worth of experience to emerge as an innovator in telecommunications technology providing communications solutions to serve our customers well into the next century. In the habit of producing quality telecommunications since 1897, Kellogg moved into the PABX Intercom equipment market in the late 1940’s, targeted to serve both “large and small subscribers”. Cortelco continues this tradition of “good talking” with the Millennium Systems, a family of ISDN-based switching platforms. Designed to serve general business communications, the Millennium’s inherent flexibility creates the environment to support new industry developments such as the CTI and VOIP revolution. Among the Millennium’s strengths are its networking capabilities that provide seamless integration of systems and remote fiber shelves which extend the loop length of a system. Also, because ACD is a standard software offering, the Millennium affords an efficient, yet cost effective tool for any business with ACD applications.